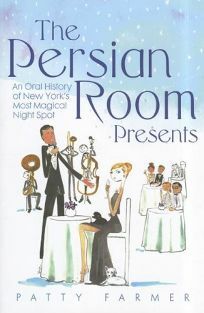 Once upon a time, the Persian Room was rated among the best of the swank nightspots in New York City, taking its place with the Copa and the 21 Club. Farmer, a lover of all things cabaret and high style, fondly takes the reader back to the glory days of the Plaza Hotel's elegant, sophisticated supper club, which showcased top-drawer acts in a posh setting of ruby-colored chairs, crimson velvet drapes, and a 27-foot-long bar. From 1934 to its closing in 1975, the Persian Room was a romantic, cherished escape from the bitter realities of the world, with fine food and cocktails, and stellar talents such as Hildegarde, Victor Borge, Julie Wilson, Andy Williams, Polly Bergen, Bob Hope, Lillian Roth, Carol Channing, Edie Adams, Dinah Shore, Ethel Merman, Robert Goulet, and Frank Sinatra. With such a tribute, there is a sizable amount of name dropping and light gossip, including singer Connie Stevens meeting hubby Eddie Fisher there and Celeste Holm's dates with John F. Kennedy. Achieving a magical sense of time travel in photos and text, Farmer's homage to the Persian Room is a return to golden memories at a mythical venue unlike any other.